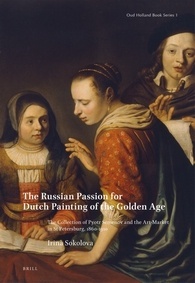 In The Russian Passion for Dutch Painting of the Golden Age, Irina Sokolova presents the collection of paintings created by Pyotr Petrovich Semenov-Tyan-Shansky (1827–1914), an outstanding scholar and Russian statesman during the era of liberal reforms in Russia. Not only did this man of great erudition assemble a unique body of more than 700 works by Dutch and Flemish masters, but he pushed hard to ensure that it entered the Imperial Hermitage in 1914. His activities as a collector have until recently remained largely unknown. For the first time in English, this richly illustrated book unfolds the history of Semenov’s gallery against the background of cultural and artistic life in St Petersburg and the close ties between Russian and European connoisseurs of his time.